A big game hunter from Mombasa, Roland Tembo was widely regarded as the best of the best. 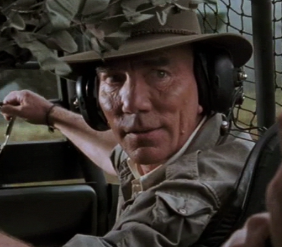 He was chosen by Peter Ludlow to be the team leader of his expedition to Isla Sorna to capture dinosaurs, although he originally turned down the invitation. Bored with hunting because he was always too successful, he believed no quarry existed on Earth that could give him a challenge. He was so bored in fact, that he purposefully picked a fight with some rowdy tourists in his favorite Mombasa bar for harrassing a waitress and interrupting his reading. His longtime friend, Ajay Sidhu, is the one who ended up convincing him to go to Sorna. An extremely levelheaded, serious man, Roland took charge with an iron fist, bossing even Ludlow around. He made sure the men under his command made no mistakes and performed only to the very best of their ability. 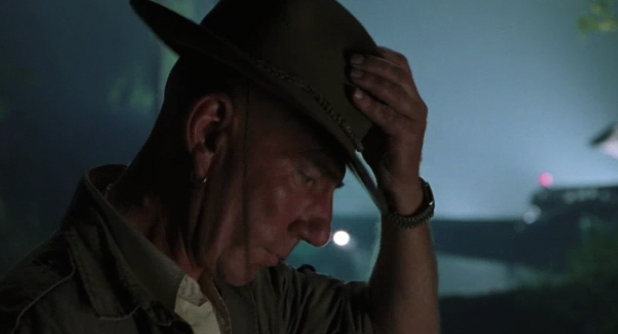 Unable to properly pronounce any of the dinosaurs’ names as listed on the InGen Specimen packet, he quickly fell to giving them nicknames based on features such as “Friar Tuck” for a Pachycephalosaurus and “Elvis” for the Parasaurolophus. Uninterested in money, Roland made certain Ludlow allowed his payment to be the right to hunt one of the male Tyrannosaur. To this end, he attempted to use a baby Tyrannosaurus as bait to lure the adult into the open. Despite being a hunter, Roland was not bloodthirsty or cruel, unlike Dieter Stark. When Dieter was killed he showed a rarely-seen compassionate side and asked that no one tell Kelly, and when he saw Sarah Harding’s bloody jacket, thinking it was her blood, he immediately made sure she was alright. Because Nick Van Owen had stolen the shells from his rifle, Roland had to use tranquilizers to defeat the male Tyrannosaurus when it attacked the hunters’ makeshift camp. Afterwards he learned that Ajay had been killed, news that deeply saddened him. Not wanting to spend any more time “in the company of death,” Roland wisely quit Ludlow’s employ, turning down a job offer at InGen and went home. Roland Tembo was an even tempered man who made decisive moves based on as much information as he could gather. A noble man of experience, Roland could be considered the last of the “great white hunters”, and his attire on the hunt reflected this. 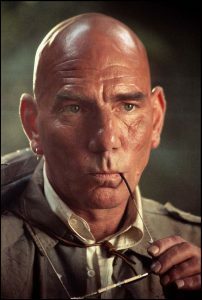 Dressed in a pressed white collared short sleeve button up, a vintage Willis & Geiger fur felt hat with custom braided band and Willis & Geiger Hemingway style cotton bush poplin safari jacket, Roland stood out from the crowd when on the hunt, while staying well hidden from his quarry. Roland Tembo was played by the late, great Pete Postlethwaite.